(Seychelles News Agency) - New banknotes and coins with enhanced security features will enter into circulation in Seychelles on Dec. 5, the island nation’s Central Bank said Thursday. Thirty-five species of Seychellois flora and fauna, including the Aldabra giant tortoise and pitcher plant, will feature on the currency. Four different-sized paper banknotes -- 500 rupees, 100 rupees, 50 rupees, and 25 rupees -- and seven denominations of coins -- 10 rupees (previously a bank note) 5 rupees, 1 rupee, 25 cents, 10 cents, 5 cents, and 1 cent -- will be introduced. The current banknotes and coins will remain legal tender and will be in circulation until they are officially demonetized by the Central Bank of Seychelles. The current banknotes and coins have been in circulation since 1998 and 1982 respectively. “We don’t encourage the public to change their money in bulk as this will put pressure on demand. Members of the public will get the new banknotes and coins when they transact or get money from banks and this will happen gradually,” said Head of Banking Services Mike Tirant. 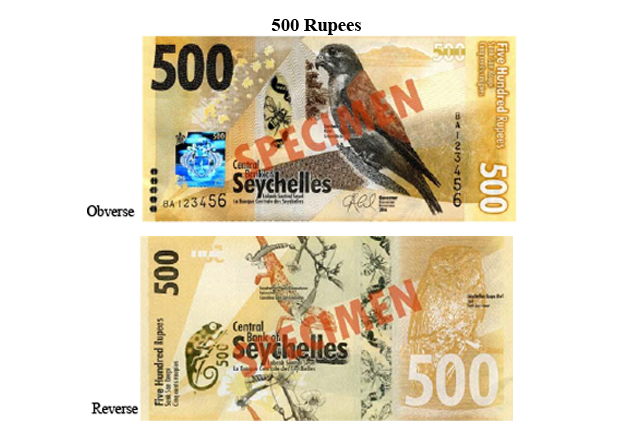 The new currency series is themed “Seychelles’ Unique Biodiversity -- the backbone of our economy,” Abel said. “The design of the new family of banknotes and coins incorporates the beauty of the Seychelles’ endemic flora and fauna as thematic icons,” said Abel. Revealing the new currency during a news conference, Tirant said the general changes in the banknotes include their design and orientation, where the writings can now be read both vertically and horizontally. Presently the writings on the bank notes can only be read horizontally. A uniform font and format have also been used for the texts on the banknotes and coins which will appear in all three national languages -- English, French and Creole. Tirant said the aim is “to celebrate our trilingual heritage.” The Seychelles flag also feature on all the notes and coins. Tirant added that the public will also notice a change in the size of the bank notes. “The 500 rupees will be smaller than current banknotes and each denomination will be smaller from the highest to lowest,” he said. With regards to the change from the 10 rupee note which will now feature as a coin, Tirant said this is due to the fact that the 10 rupee banknotes are usually the first to get spoiled. He noted that 290,000 10 rupee banknotes have been removed from circulation and replaced in 2016. New features that will allow visually impaired persons to differentiate the bank notes is another new addition. “There is a tactile raised print feature on all banknotes. For example there will be small coco-de-mer nuts on all the notes -- two coco-de-mer on the 25 rupee note, three on the 50 rupee, four on the 100 rupee and five coco-de-mer on the 500 rupee note,” Tirant explained. 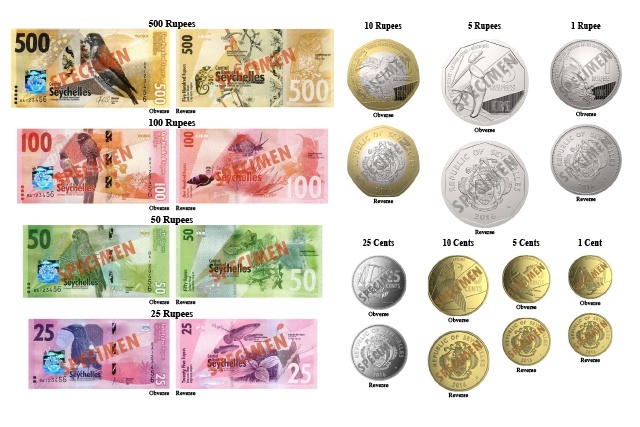 The Central Bank of Seychelles said that to ensure a smooth transition, certain elements of the design have been retained, such as the general colour scheme of the banknotes, although Tirant said the new colours are more vibrant. The most noticeable change is in the 500 rupee note, which will appear predominantly yellow instead of its present orange-brown colour. 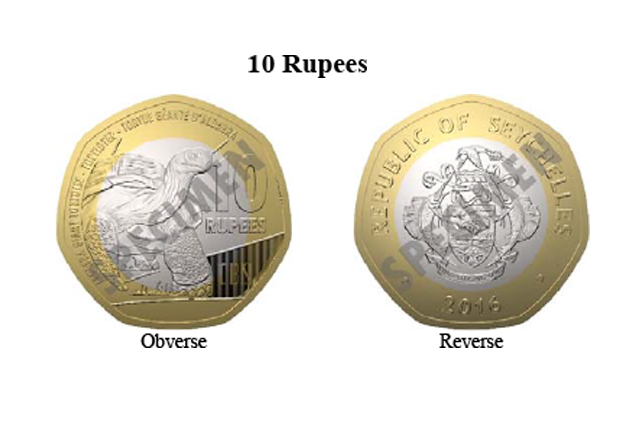 The Seychelles' reserve bank said that 5 million copies of each denominations have been manufactured and they will be issued periodically based on demand from commercial banks. The last time Seychelles issued new bank notes was in 2011, when the 100 rupee banknotes were replaced with new ones. It took two years to remove all of the old notes from circulation. Tirant said the switch will not affect the economy. “There might be a perception that this will have an impact on inflation, but it’s not the case as we are not changing the denominations or changing the values, but rather replacing them. So everything remains the same,” he said Tirant. The Central Bank said it has cost some 35 million rupees [around $2.6 million] to produce the new currency series, which has been timed with the commemoration of Seychelles’ 40 years of independence, in June this year.